STEPHENVILLE – Tarleton State was swept in Saturday’s home finale by West Texas A&M. The teams kept things tight over the opening 32 points, which saw the TexAnns tie the game on eight different occasions through 16-16, a take a brief lead at 6-4, but West Texas A&M pulled away with five unanswered points to lead 21-16 and eventually took the first set 25-20. In the second set, it was more of the same as the two teams battled point-for-point over the opening 32 points to take things to a 16-16. After that, however, the TexAnns were unable to convert consecutive points down the stretch and fell 25-22. 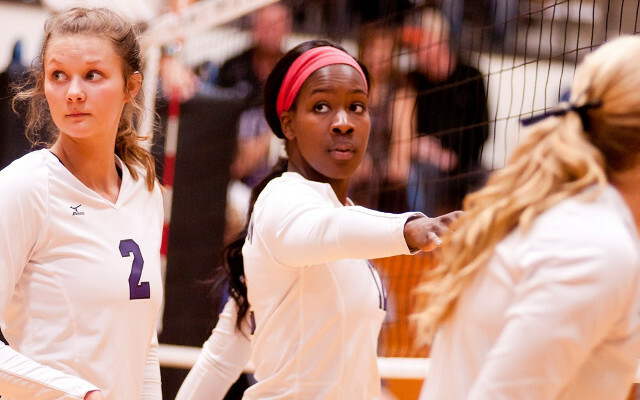 West Texas came out and took an early lead in the third set before a quick 4-1 push from the TexAnns – started by a Kenya Alexander kill and capped off with a kill from Ashley Rine – to even the set at 13-13. The Lady Buffs answered with three straight, however, to retake the lead and eventually go on to a 25-20 win and the sweep. Tarleton hit .255 on 40 kills and just 13 errors, but West Texas A&M hit .324 on 48 kills and 14 errors.Hailey Roberts led the team with 15 kills and 11 digs, while Katie Covell also recorded 11 digs. Emily Medlin (24) and Chandler Gow (12) combined for 36 assists in the game. Before the game, Tarleton State honored its four seniors playing in the final home game of their careers – Rine, Kaitlyn White, Jasmyne Brown and Covell. The TexAnns will return to action next Friday in the regular season finale in San Angelo for another battle of regionally ranked team when they square off with the Rambelles at 7 p.m.